Science of the Saints, 29-XII-2018 (16 Dec.), The Holy Prophet Aggeus. Previous Previous post: Science of the Saints, 28-XII-2018 (15 Dec.), The Holy Martyr Eleutherius. 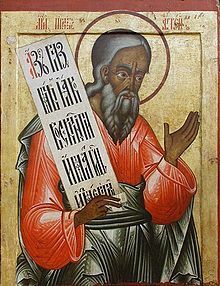 Next Next post: Science of the Saints, 30-XII-2018 (17 Dec.), The Holy Prophet Daniel and the Three Holy Children, Ananias, Azarias, and Misael.